The mission of the Detroit Kennel Club (DKC) is to provide education concerning the pure-bred dog through its annual back-to-back dog shows. This is achieved in two ways: in showcasing the many arenas in which dogs registered with the American Kennel Club can participate, the DKC endeavors to raise the awareness of the pure-bred dog’s remarkable versatility; and by providing a unique opportunity for the public to meet dedicated and knowledgeable breeders, it aids and encourages those in the market for a pure-bred dog to make an informed and appropriate choice. In addition, the Detroit Kennel Club provides a superior venue for those who own AKC pure-bred dogs to participate and compete in a variety of events. In return, those participants help the DKC in its efforts to educate spectators on the many facets of pure-bred dog ownership. The First Detroit Kennel Club benched dog show was held in April of 1916 at the Detroit Armory. There were four judges and catalogs cost twenty-five cents. The 1917 catalog lists over 250 Detroit Kennel Club members, many from the moneyed families of Detroit. In its first few years of existence, the location of the show alternated between the Armory and the Michigan State Fairgrounds, and the time of year of the event varied as well. By the 1920s, the show had moved to the Detroit Convention Hall located at Cass, Woodward and Canfield Avenues. The annual benched show soon afterward became a March tradition, and the catalog price rose to fifty cents! In 1949, the show moved back to the Fairgrounds where it remained until its relocation to Cobo Hall in 1964. In 2013, the show moved once again, this time to the Suburban Collection Showplace in June, where it remains today. Up until the 1950s, there were often as many as twenty veterinarians in attendance at the Detroit Kennel Club shows, as all dogs had to be inspected for distemper and other contagious diseases before being allowed to enter the exhibition hall. As a benched show, in the early years, dogs had to remain on the bench until the show doors were closed at 10 p.m., and were only allowed to exercise at specific times during the day. Today, the show is unbenched to better reflect the culture of contemporary dog shows. And while dogs are not required to be onsite for the entire day, there are still many dogs to be seen and enjoyed throughout the show day. 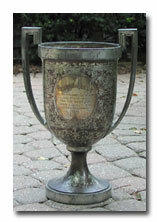 Early shows also included an abundance of trophies, offered for nearly every class and placement, much like the cup pictured above, which was awarded to the Best Bred-By and Owned Llewellyn Setter in 1916. Famous names appear in many of the old catalogs. The 1931 Catalog lists Geraldine Dodge of Madison, New Jersey as the Shepherd Dog judge. Exhibitors at that show included Erik Bergishagen, father of the recent past DKC President Erik Bergishagen, showing two of the early Jagersbo Pointers and English Setters. Since 1916, the largest Detroit Kennel Club entry was 3798 dogs, which occurred at the 1978 show. The largest single breed entry at the DKC was 223 Borzoi. The Detroit Kennel Club show became a back-to-back show in 1998. Always seeking to represent the best of pure-bred dogs, the DKC shows provide enthusiasts today–both exhibitors and spectators–opportunities enjoy many special events which accompany the traditional conformation shows. Recent events have included scent work, weight pulls, service dog exhibitions, obedience and rally trials, as well as special exhibits of rare breeds seldom seen in the US. The DKC looks forward to continuing to share the amazing world of pure-bred dogs into the next century and beyond.